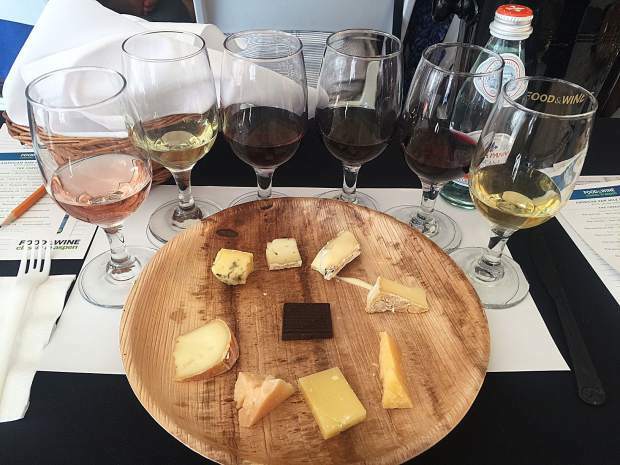 Cheese and wine pairings at Laura Werlin's seminars are sublime. Wine events and festivals can be challenging. On the one hand, there is the opportunity to taste many great wines in a short period of time. You can, in the course of a couple of hours, gain access to myriad grapes and wine styles, which you simply can’t do if you are, say, looking at labels in a wine shop. On the other hand, when tasting so many different wines in a concentrated time frame it is easy to become both confused and tongue tired. After a few glasses, the subtleties of the sauvignon and the semillon begin to blur between sips. The palate is a fairly gentle thing and bombarding it with varied flavors, while at the same time overwhelming your nose with decidedly disparate smells, can be overwhelming. So it is that each year I end up in a virtual puddle at the end of the Aspen Food & Wine Classic. There are so many wines poured, be it in seminars, the Grand Tasting tents, after parties, and just amongst friends between scheduled events, that there is a sense of being conquered. “Dazed and confused” is a term that comes to mind. Ah, but as a professional I do keep some sense of order by writing notes, taking photographs and gathering written materials. So I thought I would share a few with you that I will likely remember and perhaps write about in future columns. Some are old friends, some are new to me, but all made a lasting impression. Let’s start with some of the pinots, because there were some really good ones. The Olivet Lane wines, from a picture-perfect patch of dirt in the heart of the Russian River Valley are silky, aromatic, and complex. This family owned company also produces another label of Sonoma wines, the eponymous Pellegrini. While a little different in composition, perhaps a bit more approachable, they are equally delicious. And I would be remiss if I did not mention another outstanding pinot noir from the Sonoma-based Benovia. I tasted their wines in the fog of battle in the tents and was initially star-struck. But it was the 2014 Benovia “La Pommeraie” Pinot Noir, sourced from a Russian River Valley vineyard that once was formerly a Gravenstein apple orchard, that really harvested my attention. Poured during a seminar with Laura Werlin that paired wines with raw milk cheeses, the wine was sublime. A comer to be sure. Another pinot that appealed came from an urban winery in Portland, Ore., called Welsh Family Wines, which is run by tech-runaways Dan Welsh and his wife Wendy Davis. Just three vintages in, they are making low intervention, accessible, food-friendly pinot noir from a variety of vineyard sites in the Willamette Valley. They also poured me an interesting and unexpected Blaufränkisch. Nice people and nice wines. Let’s keep an eye out for this winery. And yes, in case you are wondering, they do pour wines other than pinot noir at the Classic. Rob Leventhal, an Aspen-based distributor, introduced me to a line of wines called McCauley Vineyard that is producing wines from vineyards with high profile names like To Kalon and Bacigalupi. A joint venture between Mac Watson and Kirk Venge, I enjoyed their exquisite cabernet sauvignon, but was smitten by an Old Vine Zin sourced from Napa fruit. While we are in Napa, a new high-end, limited production winery called Nellcôte caught my eye. Two automotive-themed cabernet sauvignons, a “Rallye 76” and a “500 Chevaux,” were powerful and stunning, but it was a rosé of malbec and syrah from Mt. Veeder that was the most intriguing. This was proprietor Tyler Olbres’ first Classic foray, but I’m sure it will not be his last. Perhaps the hottest wine nation in the world right now is Portugal. Once known exclusively for the fortified port wines of the Douro Valley, that region and others, including the mountainous Dão, are producing still wines that are great values. New to me was a grape called Jaen. The Casa Americo Jaen (a 2015, I think) from the Dão DOC was bright on sight and had a fresh, fruit forward flavor profile. I will look forward to my next meeting with the grape. And then there was the Chateau de Beaucastel Chateauneuf-du-Pape Blanc 2014 poured at a luncheon at the Little Nell. And Food & Wine editor Ray Isle’s 2011 Bodegas Palacios Herencia Remondo Propriedad that was offered during the Rioja seminar.